Q: Where do I purchase tickets to ride the train? A: Tickets can be purchased at the Guest Services Desk located in the food court. Tickets are $4.00 each, 2 years or older; free for under 2 years old. Single ride passes are available Friday-Sunday. Upgrade your single-ride pass for $1 extra and receive 2 rides instead of one! Prices exclude special events. Q: Do you offer any events for kids? A: Yes, we offer many events annually for children to enjoy with their families, including visits with Peter Cottontail, Pumpkin Patch Train Rides, and visits to Santa's Workshop. We also offer meet and greets with popular characters and our very own mascot Chugga Chugga Charlie. On the North side of the property we also have a playground with plenty of room to enjoy. We also offer a birthday engineer experience for children ages three through 12. Q: Do you have stroller/wheelchair rentals? A: Yes, visit Guest Services Desk located in Ohio Central Station (food court) for information regarding rentals. Q: Which stores are located at Ohio Station Outlets? A: Click here for a list of national retailers at Ohio Station Outlets and here for a list of Ohio-based retailers. Q: Where can I find out about job opportunities at Ohio Station Outlets? A: Click here to view our current career opportunities. Q: What are the Ohio Station Outlets hours of operation? A: Hours vary during the year depending upon the season and special events planned. Please see our Hours & Info page for our current hours of operation. Q: Do you have any special holiday hours? A: Yes, we offer extended shopping hours during the holiday season. 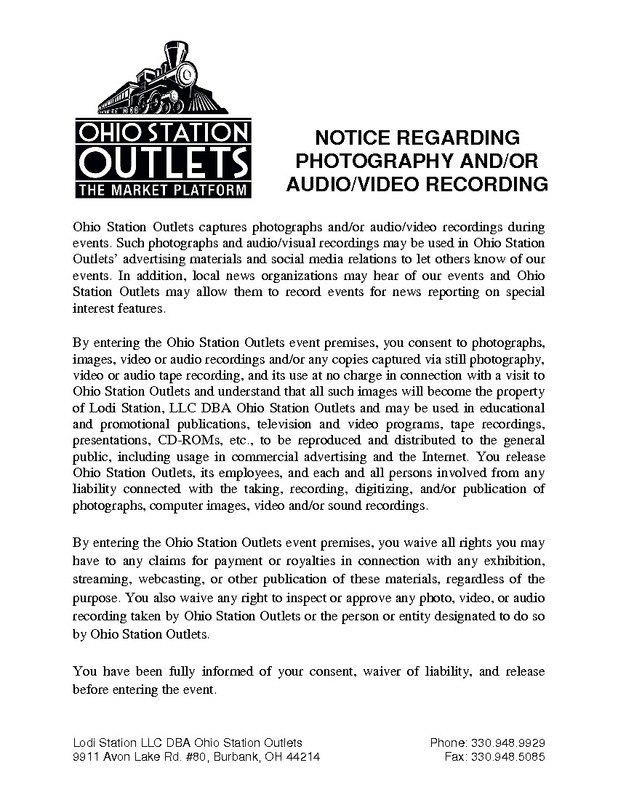 Q: Where is Ohio Station Outlets located? A: Ohio Station Outlets is conveniently located off I-71 at exit 204. We are just a 45-minute drive from Cleveland or Akron/Canton and 90 minutes north of Columbus. Click here for directions. Q: Do you offer a Tourism program? A: Yes, we have a great program with many incentives for tour directors, bus drivers, and passengers. Click here for group tourism information and contact Guest Services at (330) 948-9929 for further information or to schedule your tour bus arrival. Q: Do you offer a mall gift certificate? A: At this time Ohio Station Outlets does not offer a mall-wide gift certificate. Q: Do you have a shopper incentive program? A: We offer several, all of which are available at Guest Services located in Ohio Central Station (food court). Sign up as a Preferred Member to receive your Hot Ticket savings specials, or check out our Tuesday’s Golden Ticket specials (for customers 55 or older). Click here to sign up for our Preferred Member Hot Ticket program.